Youngstown State University’s Ward Beecher Planetarium will receive $650,000 in funding via a NASA cooperative agreement to support the development of full-dome video and 3D animation materials that will be distributed for free to planetaria across the globe. The YSU funding is part of an $11.5 million, five-year NASA Cooperative Agreement with Southern Illinois University Edwardsville. SIUE will expand its citizen science and educational activities through CosmoQuest, an online virtual research facility inviting the world to join in exploring our Universe. CosmoQuest is led by project director Dr. Pamela Gay, assistant research professor in the SIUE Center for STEM Research, Education and Outreach. It brings together scientists, educators, and software developers from eight collaborating institutions and numerous additional partners. CosmoQuest launched in 2012 as a second generation citizen science site designed to bring the public the kinds of opportunities often only found in brick and mortar universities. Brick by virtual brick, programs ranging from science projects to science classes, and from planetarium shows to online seminars have been brought to life in CosmoQuest’s virtual hallways. 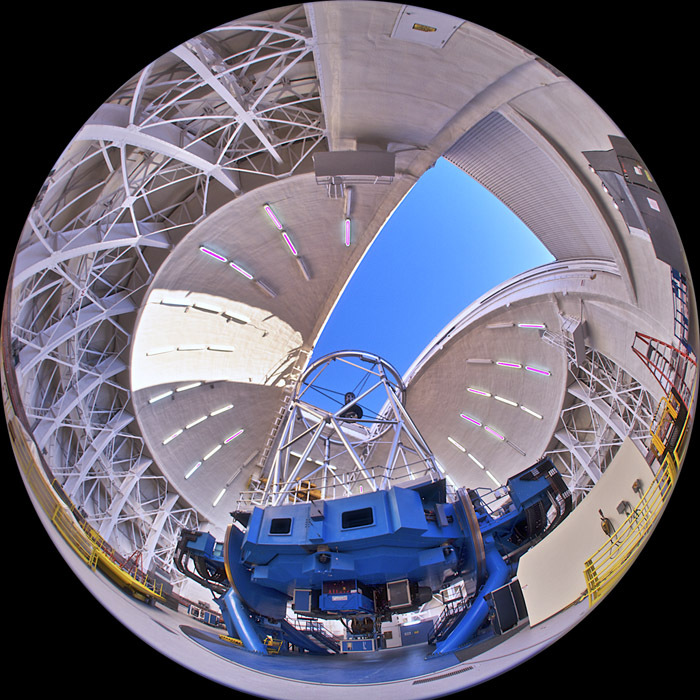 A full-dome, fish-eye image of the Gemini Telescope in Hawaii, photographed by Patrick Durrell, YSU associate professor of Astronomy and director of the YSU Ward Beecher Planetarium. The photo was part of an earlier collaboration with CosmoQuest. YSU’s association with CosmoQuest dates to 2012 when the Ward Beecher Planetarium produced its first full-dome planetarium movie called “Cosmic Castaways.” The following year, the planetarium partnered with CosmoQuest to make available full-dome images of telescopes on the summit of Maunakea free-of-charge (as part of a creative commons license) to other planetaria across the world. The NASA award is a continuation and expansion of that work, Durrell said. Ward Beecher will now produce videos and images chronicling “citizen science” projects that will be developed by members of the CosmoQuest team, which also includes Planetarium engineer Curt Spivey. With the funding, YSU plans to hire a content designer to create the videos and images, as well as a student to assist, Durrell said. The funds also will be used to upgrade the planetarium’s computing facilities and to purchase a new high-resolution full-dome video camera system. Other organizations involved in the grant include the Astronomical Society of the Pacific, InsightSTEM, Interface Guru, Lawrence Hall of Science, Johnson Space Center, McREL International, the Planetary Science Institute, and McDonald Observatory. For more information, visit www.CosmoQuest.org.